Two years ago when Becky Basalone and her two young sons first painted a pumpkin teal, she had no idea where that little pumpkin would lead. Becky had recently started FACET (Food Allergy Community of East Tennessee), an AAFA-affiliated support group. The pumpkin was part of her family’s decorations for a local allergist’s “trunk or treat” event. She also brought a scarecrow, a bucket of non-food treats and contact cards for FACET. The event was a success, and Becky was excited to meet many people who were interested in joining the support group. When they got back home Becky’s oldest son, who was then five years old, put the teal pumpkin on the porch with the other decorations. Then he put the bowl with the rest of the non-food items by the door next to the bowl of candy. These were mostly gag gift-type items like slime and silly eye glasses. Becky thought that having these available for kids who couldn’t have the candy was a great idea. On Halloween night the teal pumpkin turned out to be a great conversation starter for food allergy awareness. When people came to the door Becky’s son held up the two bowls. “Do you want ‘tricks’ (the non-food items) or ‘treats’ (candy)?” he asked. And the “tricks” turned out to be a bigger hit than the candy! By the end of the evening, Becky realized that Teal Pumpkins could be a fun thing for others in the support group to do, too. “This became a project that the FACET leadership team worked on together,” Becky explains. “Last year we launched the Teal Pumpkin Project to our support group network. We printed up posters and fliers. These asked people to paint a pumpkin teal to show that they have non-food treats available besides candy. This year the Teal Pumpkin Project was launched nationally with media outreach by FARE, and the response has been huge. Millions of people have seen media stories, including television reports, and social media posts about the project. The Teal Pumpkin Project is now raising awareness about food allergies across the US and around the world. What started as one little painted pumpkin has become a new tradition for many. Paint a pumpkin teal and place it on your porch. This lets other families know that you have non-food treats available at your home. View a list of recommended non-food prizes and treats from Kids With Food Allergies (this list can be used for Halloween, school and other celebrations). Print out the poster that’s available at https://blogdotfoodallergydoto...eal-pumpkin-sign.pdf and place it on your front door. Keep your bowl of non-food treats separate from any candy, to ensure that the non-food items stay safe. 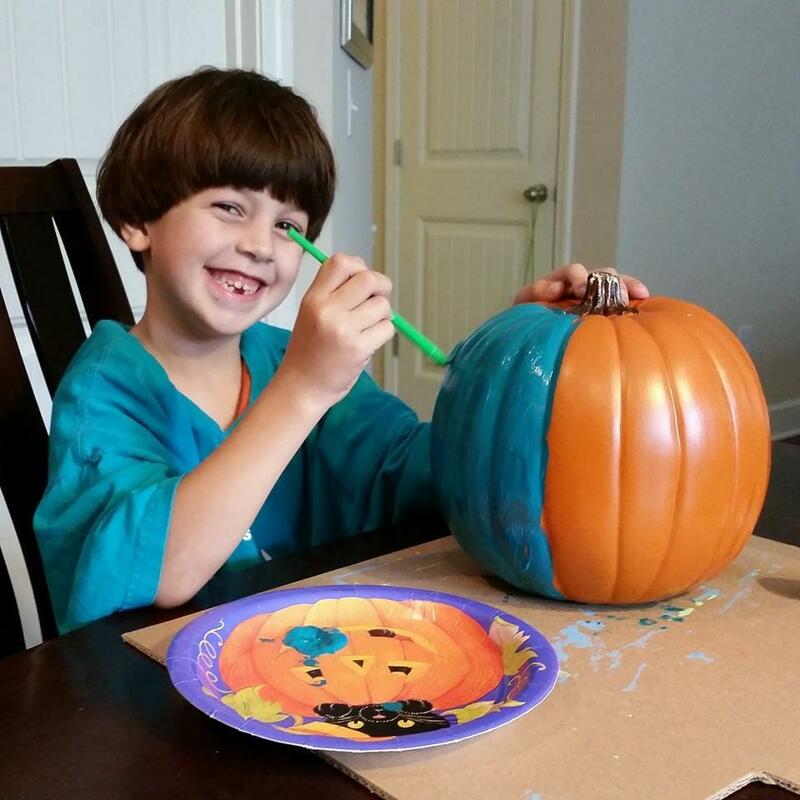 Presley, age 7, allergic to dairy, eggs, & peanuts, is painting his pumpkin to let other children with food allergies know that his house will have non food treats for them this Halloween. We have another blog post w/ posters and coloring sheets. We also have a great 1-page handout w/ ideas for alternatives. You could also bake a fun safe-for-you cake. My preteen just likes being with his friends, for the most part. I like the idea of donating extra candy to volunteers in your town. What are some other ways people deal with Halloween? I don't think this teal thing should stop by any means, but I am having a hard time seeing it as a widely accepted solution. I have a peanut/treenut allergic kid and I have very mixed emotions... On the one hand, I like the added awareness, but on the other hand... I think this might be expecting too much . In our town, some neighborhoods get hundreds of kids and per item non-food stuff can get expensive. Plus, I really don't want my daughter to come home with a bunch of stuff - she has too much stuff as it is and is a bit of a hoarder. What is important to me about Halloween and trick or treating is that she see how friendly and generous her community is. What we have done as a compromise is pre-buy her candy and fill her pumpkin before she goes "trick or treating" with a group of other kids as one activity at a party. She just waits with us while the others go up to the house. Then we all go play and eat candy (her buddies know the drill on safety and we are there watching.) We don't allow any of the kids to eat while walking because of choking. She is 7 now so I'm hoping this can work for the future. So far she has been very happy with this arrangement - she likes all the candy she gets and she gets 5x what her brother brings home! The store trip is also a good label reading exercise for her. Another option for allergic kids... (depending on skin tolerance) might be to trick or treat and donate the candy to the paramedics/fire department that respond to our emergencies. Then eat their own safe candy. You're invited to participate in our 8th annual Halloween costume parade! Show us how you safely celebrate Halloween - add photos of your costumes, your teal pumpkins or your Halloween parties. You could win one of five fantastic allergy-friendly prizes! Winners will be selected on Halloween night and we have 5 grand prizes to giveaway sponsored by Enjoy Life, Surf Sweets, Divvies, Cybele's Free to Eat, and Allermates. You must be a registered member of the Kids With Food Allergies community in order to Add a Clip (photo). Please submit only one image per child. Members outside of the United States are encouraged to participate, but we cannot mail prizes outside of the U.S.